Timothy Michael Krul (Dutch pronunciation: [ˈtɪm ˈkrɵl]; born 3 April 1988) is a Dutch professional footballer who plays as a goalkeeper for Norwich City. Krul represented the Netherlands at every level between 2002 and 2011. He made his debut for the full national team in July 2011 and was part of the team that came third at the 2014 FIFA World Cup. Krul began his career at hometown club RAS and later local Eredivisie club ADO Den Haag. He joined Premier League club Newcastle United in the summer of 2005 on a three-year deal after failing to sign professional terms. ADO demanded a compensation fee and objected to the FIFA Dispute Resolution Chamber (DRC). The DRC denied the claim and ADO took the case to the Court of Arbitration for Sport (CAS). CAS ruled in February 2007 in favour of ADO, ordering Newcastle to pay €220,000 as compensation for the transfer. Following an injury to Newcastle's first-choice goalkeeper Shay Given, Krul appeared on the bench as back-up to second-choice Steve Harper. Krul made his Newcastle debut in the UEFA Cup on 2 November 2006 against Palermo. His debut was well-received; he displayed his shot-stopping abilities, saving efforts from Giuseppe Biava and David Di Michele and recording a clean sheet in the process. He was injured during the warm-up prior to the second leg tie against Palermo and then aggravated that injury in the warm-up before a game against Watford. He required two cartilage operations as a result, keeping him out of action for almost six months. He returned to action in April 2007. On 13 June 2007, he signed a new four-year contract with Newcastle. In the same month, he was part of the Dutch Under-21 squad that won the European Championships and also qualified for the 2008 Summer Olympics. On 3 August 2007, Krul joined Scottish side Falkirk on loan, originally until 1 January 2008 though it was later extended until the end of the season after a number of impressive performances. Falkirk initially wanted to sign him on a permanent deal but it was refused by Newcastle. The following day he made his debut for Falkirk and kept a clean sheet as the team won 4–0 against Gretna. In the two games immediately following his debut, he conceded four goals against Celtic and seven goals against Rangers at Ibrox. Krul was sent off for the first time in his professional career on 2 January 2008 after reacting badly to an opponent's challenge. Shortly afterwards, he suffered a dislocated shoulder during a Scottish Cup defeat against Aberdeen and missed the rest of the season. 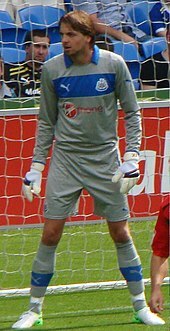 On 21 November 2008, Krul joined Carlisle United on a one-month loan from Newcastle to replace Ben Alnwick, who had rejoined Tottenham Hotspur. The loan deal was extended for a further month in December with Krul returning to Newcastle in January. Krul returned to Newcastle as backup to first choice Steve Harper. He made his senior league debut on 8 August 2009 in the opening Football League Championship game of the season away to West Bromwich Albion, coming on as a half time substitute for the injured Harper. Following this match, The Guardian called him "an excellent reserve goalkeeper". He later played the full Football League Cup match against Huddersfield Town on 26 August 2009, which Newcastle won 4–3. Krul also started the 2–0 League Cup defeat to Peterborough. Against Swansea City on 28 November, he again came on to replace the injured Steve Harper. On 2 January, he played in the FA Cup Third Round tie against Plymouth Argyle, the game ending 0–0. He then played in the replay at St James' Park on 13 January, a 3–0 victory. Krul started his first league game for Newcastle on 2 May 2010, the last day of the Championship campaign, against Queens Park Rangers at Loftus Road and kept a clean sheet. In July 2010, Krul signed a new four-year contract with Newcastle. Krul made his Premier League debut for Newcastle on 18 September 2010 against Everton at Goodison Park, coming on as a substitute in the 35th minute for the injured Steve Harper in a match that ended in a 1–0 win for the Magpies. He made his first Premier League start on 26 September against Stoke City at St James' Park. He then played against Manchester City in a 2–1 loss, Wigan Athletic in a 2–2 draw and in the 2–1 away win to West Ham United, before starting in his first Tyne-Wear derby, Newcastle winning 5–1, and a 1–0 away win at Arsenal a week later. Following his good performances, Alan Pardew gave him more chances. He eventually became first choice and Harper was sent on loan to Brighton & Hove Albion. He started the 2011–12 season well, keeping clean sheets in the first two matches of the season against Arsenal and Sunderland. On 3 December 2011, Krul made his 50th Newcastle appearance against Chelsea. He saved a Frank Lampard penalty and made several other impressive saves, although Newcastle went on to lose the game 3–0. On 3 March 2012, Krul signed a new five-year contract at Newcastle United. Krul then went on to play in the away game against Arsenal, which Newcastle lost 2–1. During the match, fellow Dutchman Robin van Persie accused Krul of wasting time throughout the match and taunted Krul after the match had ended. The row continued into the tunnel and the two players had to be separated. Although he received criticism from Arsenal player Jack Wilshere, teammate James Perch defended Krul, believing van Persie "out of order". At the end of the season, Krul received Toon Talk's Newcastle United Player of the Year award. In the summer before the 2012–13 Premier League, Krul was given the number 1 jersey, with Steve Harper receiving number 37. Krul was started the first three matches of the season before suffering an elbow injury whilst on international duty. After seven weeks off, Krul returned to training. Krul made his return in the Tyne–Wear derby on 21 October 2012, a 1–1 draw. He injured his ankle during a Europa League match in the Round of 32 against Ukrainian side Metalist Kharkiv which ruled him out for five weeks. In the Tyne–Wear derby on 14 April 2013, Krul suffered a dislocated shoulder on 57th minutes after he landed awkwardly after punching away an Adam Johnson free-kick. After surgery on his dislocated shoulder, Krul was ruled out for the rest of the 2012–13 season. Ahead of the 2013–14 season, Krul made his first appearance since his ankle injury in a friendly match against Rangers. In November, Krul made some impressive displays, conceding just two goals and keeping clean sheets against Tottenham, where he made a total of 14 saves during the match), and Chelsea. His impressive displays earned him November's Premier League Player of the Month. Krul's performance was praised by Newcastle United goalkeeping legend Pavel Srníček and manager Alan Pardew. Krul sustained an ankle injury in training before Newcastle's match with West Ham United and was ruled out for up to six weeks with the injury. Krul returned in his side's 2–0 defeat to Chelsea. On 25 August 2016, Krul signed a one-year contract extension at Newcastle United before joining Ajax on a season-long loan deal to provide him with top-tier first-team football as he continued his recovery from injury. That deal was cut short, Krul only playing six games for the club's reserve side, and, in January 2017, he joined fellow Eredivisie side AZ Alkmaar on loan for the rest of the season. On 31 August 2017, Krul signed for Premier League club Brighton & Hove Albion on a season-long loan, reuniting him with former Newcastle manager Chris Hughton. On 19 September, he made his debut for the club in an EFL Cup third round tie against Bournemouth. The following day, he signed a permanent deal with Brighton, ending his twelve-year association with Newcastle. At the end of the season, Krul left the club. Krul signed for Championship club Norwich City on 24 July 2018 on a two-year contract. Krul represented the Netherlands national team at U17 level at the 2005 FIFA U-17 World Cup in Peru. He represented the U21s at the 2008 Toulon Tournament and was a regular in the side for the 2011 European Under-21 Championship qualifying campaign. 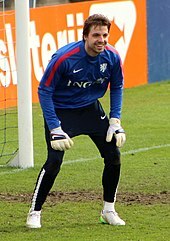 On 4 June 2011, Krul made the starting eleven for the Netherlands in a friendly against Brazil, his first cap at senior level. He went on to keep a clean sheet, pulling off a string of decent saves in a 0–0 draw. He played his second match for the international team four days later against Uruguay in a 3–4 penalty shoot-out loss, the match having finished 1–1 after 90 minutes. He was called up to the Netherlands UEFA Euro 2012 squad but did not make any appearances. In new coach Louis van Gaal's first competitive game in charge against Turkey in Amsterdam, Krul was selected as starting goalkeeper, keeping a clean sheet in a 2–0 win for the Oranje. In June 2014, Krul was included in the Netherlands' squad for the 2014 FIFA World Cup in Brazil. In the quarter-final against Costa Rica, he was brought on by Louis van Gaal as a 120th-minute substitute for the penalty shootout. He saved two of the five penalties he faced as the Netherlands won 4–3. This was the first time in the history of the World Cup that a goalkeeper was sent on as a substitute solely for a penalty shootout. As of match played 10 October 2015. ^ "Tim Krul". Norwich City F.C. Retrieved 29 December 2018. ^ "CAS verdict" (PDF). Archived from the original (PDF) on 2 April 2012. ^ "Palermo 0–1 Newcastle". BBC Sport. 2 November 2006. Retrieved 3 August 2007. ^ "Dutch Stopper Raring to Go". Newcastle United F.C. 25 April 2007. ^ "New contracts for Solano and Krul". BBC Sport. 3 August 2007. Retrieved 3 August 2007. ^ "Krul joins Falkirk in loan deal". Newcastle United F.C. 3 August 2007. Archived from the original on 6 February 2009. Retrieved 3 August 2007. ^ "Gretna 0–4 Falkirk". BBC Sport. 4 August 2007. Retrieved 4 August 2007. ^ "Cumbrians capture Krul". Sky Sports. 21 November 2008. Retrieved 21 November 2008. ^ Paul Wilson (8 August 2009). "Newcastle United given a rare glow by Damien Duff and Tim Krul". The Guardian. Retrieved 8 August 2009. ^ "Newcastle keeper signs new deal". Ontheminute.com. 29 July 2010. Retrieved 29 July 2010. ^ "Everton v Newcastle". BBC. 18 September 2010. Retrieved 18 September 2010. ^ "Newcastle v Stoke". BBC. 26 September 2010. Retrieved 26 September 2010. ^ "Fabricio Coloccini and Tim Krul sign new Newcastle contracts". BBC. 3 March 2012. Retrieved 3 March 2012. ^ "Thomas Vermaelen hit a 95th-minute winner as Arsenal closed to within a point of third-placed Tottenham". BBC. 12 March 2012. Retrieved 12 March 2012. ^ "Robin van Persie's expert antagonization of Newcastle's Tim Krul". Yahoo! Sports. 13 March 2012. Retrieved 13 March 2012. ^ "A bit Krul! Wilshere mocks 'crying' Newcastle keeper after Arsenal victory". Daily Mail. 13 March 2012. Retrieved 14 December 2013. ^ "Perch: RVP was out of order with Tim Krul taunts". Chronicle Live. 14 March 2012. Retrieved 14 December 2013. ^ "Tim Krul wins Toon Talk's NUFC player of the year". Chronicle Live. 9 May 2012. Retrieved 14 December 2013. ^ "Number one shirt is the proof of Tim Krul's ascent". The Journal. 28 July 2012. Retrieved 14 December 2013. ^ "Steve Harper ready to step in for injured Tim Krul at Newcastle United". Sky Sports. 11 September 2012. Retrieved 14 December 2013. ^ "Newcastle United defensive duo set for derby return". Chronicle Live. 19 October 2012. Retrieved 14 December 2013. ^ "Sunderland 1–1 Newcastle". BBC Sport. 19 October 2012. Retrieved 14 December 2013. ^ "Newcastle United goalkeeper Tim Krul ruled out for five weeks". BBC Sport. 28 February 2013. Retrieved 14 December 2013. ^ "Newcastle 0–3 Sunderland". BBC Sport. 14 April 2013. Retrieved 14 December 2013. ^ "Newcastle keeper Tim Krul out for season after dislocating his shoulder". Sky Sports. 14 April 2013. Retrieved 14 December 2013. ^ "Tim Krul confident ahead of new season after successful return from injury". Sky Sports. 8 August 2013. Retrieved 14 December 2013. ^ "Tim Krul". Sky Sports. 4 December 2013. Archived from the original on 15 December 2013. Retrieved 14 December 2013. ^ "Newcastle's Alan Pardew and Tim Krul the Premier League manager and player of month for November". Sky Sports. 6 December 2013. Retrieved 14 December 2013. ^ "Toon goalkeeping legend Pavel Srnicek backs Tim Krul to keep improving". Chronicle Live. 18 November 2013. Retrieved 14 December 2013. ^ "Tim Krul is 'one of the the best' keepers in league – Alan Pardew". BBC Sport. 10 November 2013. Retrieved 14 December 2013. ^ "Tim Krul injury". BBC Sport. 1 December 2014. Retrieved 1 December 2014. ^ "Tim Krul return". BBC Sport. 10 January 2014. Retrieved 10 December 2014. ^ "Krul Joins Ajax on Loan". Newcastle United Official Site. 25 August 2016. Retrieved 25 August 2016. ^ "Tim Krul: Newcastle United goalkeeper joins AZ Alkmaar on loan". BBC Sport. 31 January 2017. ^ "Albion Sign Dutch Keeper on Loan". Brighton & Hove Albion F.C. 31 August 2017. ^ "Bournemouth 1–0 Brighton (aet)". BBC Sport. 19 September 2017. Retrieved 20 September 2017. ^ "Tim Krul: Brighton sign Newcastle goalkeeper on one-year deal". BBC Sport. 20 September 2017. Retrieved 20 September 2017. ^ "First Fulham, now Stoke are after Albion goalkeeper Tim Krul". The Argus. 2 July 2018. Retrieved 18 July 2018. ^ "Norwich City sign Dutch goalkeeper Tim Krul". Norwich City F.C. 24 July 2018. Retrieved 29 December 2018. ^ "Ten-man Brazil draw blank against Dutch". FIFA. 4 June 2011. Retrieved 22 June 2011. ^ "Uruguay get one back over Dutch". FIFA. 8 June 2011. Retrieved 22 June 2011. ^ "Netherlands 0–0 Costa Rica". BBC Sport. 5 June 2014. Retrieved 6 June 2014. ^ Dimond, Alex (5 July 2014). "Tim Krul's Saves Vindicate Louis Van Gaal's Latest Bold, Arrogant Gamble". Bleacher Report. Retrieved 6 July 2014. ^ "Tim Krul joins Tranwell Woods wind farm battle". The Journal. 30 November 2013. Retrieved 7 July 2014. ^ "Krul: Alleen geboorte van mijn dochter was mooier" (in Dutch). RTL Nieuws. 6 July 2014. Retrieved 7 July 2014. ^ "Games played by Tim Krul in 2006/2007". Soccerbase. Centurycomm. Retrieved 4 October 2017. ^ a b "Games played by Tim Krul in 2007/2008". Soccerbase. Centurycomm. Retrieved 8 June 2018. ^ a b "Games played by Tim Krul in 2008/2009". Soccerbase. Centurycomm. Retrieved 8 June 2018. ^ "Games played by Tim Krul in 2009/2010". Soccerbase. Centurycomm. Retrieved 4 October 2017. ^ "Games played by Tim Krul in 2010/2011". Soccerbase. Centurycomm. Retrieved 4 October 2017. ^ "Games played by Tim Krul in 2011/2012". Soccerbase. Centurycomm. Retrieved 4 October 2017. ^ "Games played by Tim Krul in 2012/2013". Soccerbase. Centurycomm. Retrieved 8 June 2018. ^ "Games played by Tim Krul in 2013/2014". Soccerbase. Centurycomm. Retrieved 4 October 2017. ^ "Games played by Tim Krul in 2014/2015". Soccerbase. Centurycomm. Retrieved 4 October 2017. ^ "Games played by Tim Krul in 2015/2016". Soccerbase. Centurycomm. Retrieved 4 October 2017. ^ "Games played by Tim Krul in 2016/2017". Soccerbase. Centurycomm. Retrieved 4 October 2017. ^ a b "Tim Krul: Club matches". WorldFootball.net. HEIM:SPIEL. Retrieved 8 June 2018. ^ a b "Games played by Tim Krul in 2017/2018". Soccerbase. Centurycomm. Retrieved 8 June 2018. ^ "UEFA European U-17 C'ship: Netherlands 0–2 Turkey". UEFA. 14 May 2005. Archived from the original on 16 August 2014. Retrieved 21 August 2014. ^ "FIFA U-17 World Championship Peru 2005 – Netherlands 2:1 (1:0) Turkey". FIFA. 2 October 2005. Retrieved 21 August 2014. ^ "Jong Oranje clinch European crown". UEFA. 24 June 2007. Retrieved 23 September 2014. ^ "2014 FIFA World Cup Brazil: Brazil-Netherlands". FIFA. 12 July 2014. Retrieved 21 August 2014. ^ "Tim Krul: Overview". Premier League. Retrieved 29 September 2018. 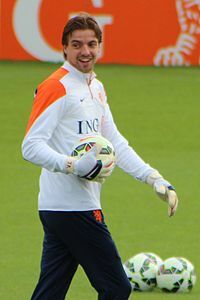 Wikimedia Commons has media related to Tim Krul. This page was last edited on 19 April 2019, at 20:46 (UTC).